Part of the beauty of South Tyrol is its delicious blend of Austrian and Italian cultural influences. While the majority of locals speak German as their first language, many South Tyroleans are bilingual. This is immediately evident as you encounter signs in German and Italian upon entering the region. You certainly do not need to know either language to visit South Tyrol; however, your trip will be more rewarding by becoming a little familiar with either one. If you like the sip-easy sound of the Italian language over the harsh swig of German dialect, this article is for you. 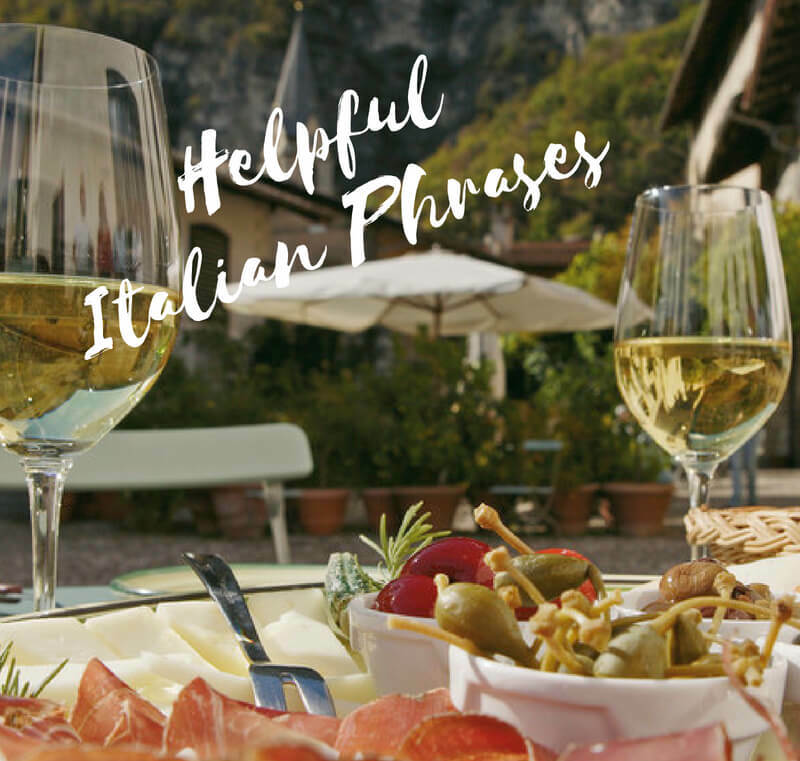 We cover the basics, as well as give you useful Italian travel phrases. Which one rolled off the tongue easier? If it was the first, you might prefer bratwurst over pizza and may want to head over to our helpful German phrases article. Insider Tip: Before reading any further we’d like to point out that you can access a PDF of the Key Italian Phrases Guide and our German Phrases Guide in our FREE South Tyrol Travel Resources Library. We made it handy to print out or keep on your tablet or phone while traveling. Before diving into key Italian phrases it’s helpful to have a grasp on proper pronunciation. This will come in handy when running into specialties listed on a menu or when meeting someone, for example. After all, you don’t want to come off a like Brad Pitt when saying goodbye to your new Italian friends. “R” is almost always rolled…and almost always fun to say! Buona sera (Bwohn ah say rah) – Good evening. After starting a dialogue, you may want to inform the person that you speak a little Italian. If you do not want to attempt any conversation in Italian, let the person know you do not speak any Italian. Then, you would want to follow this by asking them if they speak English. If the person responds “No”, they do in fact mean “No”. “Yes” in Italian, on the other hand, is “Si” (see). While in Italy you should know how to ask where something is located. Nothing is more important when nature calls and you are in the middle of a castle tour that is entirely in Italian. True story. Best told over vino (wine). Where is the bathroom? : “Dove’ il bagno?” (doe VEH eel BHAN-yo). Come ti chiami: What is your name? Quanto costa il biglietto: How much is the ticket? Hopefully, you’re able to avoid getting sick while traveling, but if not keep an eye out for signs indicating “Farmacia” and “Ospedale”. Knowing how to tell time in Italy will really only be useful if you forget your watch or if your smartphone dies. In that case, this highly-instructional video shows you how to accurately ascertain the time when roaming the Italian countryside. Once you’ve made your way to the supermercato, panetteria or cantina, knowing numbers in Italian helps understand prices, order quantities, etc. Note: Replace vini rossi with vino rosso for a single glass of red wine. Note: Replace uno with una for a single glass of beer. A che ora chiudete? : What time do you close? A che ora apri? : What time do you open? Hai un menu? : Do you have a menu? Posso vedere la lista dei vini per favore? : Can I see the wine list please? Quanto le devo? : How much do I owe? Puoi scriverlo per favore? : Can you please write that down? Posso avere il conto per favore? : Can I have the bill please? Posso pagare in contanti? : May I pay with cash? Posso pagare con la carta di credito? : May I pay with credit card? If you’re traveling all the way to Italy, there’s a good chance you’ll treat yourself to gelato. To make sure you’re ready, we highly recommend checking out the Lazy Italian’s post specifically dedicated to the art of ordering gelato. Enjoying an authentic pizza is equally likely to be top of mind during your trip. ITALY magazine has a nice piece on what you can expect when ordering pizza. Coffee Break Italian Podcast: This podcast has free and members-only versions. While there are additional bonus materials available to members, the free podcast is exceptional. Out of the three resources we mention here, this is the most beneficial for travel in Italian-speaking regions. Another advantage to this podcast is that the hosts provide details on grammar, cultural nuggets, review past lessons and break down the language. If you do not have any Italian language experience, we recommend starting with episode 1. Duolingo: Duolingo is a fun and easy way to begin learning Italian. It requires 5 minutes a day. Not only does Duolingo provide lessons, but you can engage in short, situational chats to practice responses. As you progress, Duolingo provides a percentage fluency score that helps to see how well you are progressing. Pimsleur Italian Language Program: Older versions of the audiobooks are usually available at public libraries and are a great way to learn a language during your commute. Depending on your skill level, there are a variety of programs you can select. The program is also available on Audible. We’ve learned that the most important part of learning a new language is not to judge yourself too harshly or to take yourself too seriously. Sure you may get frustrated, but just remind yourself that you’re on vacation after all. You’re going to make mistakes and sound silly. Everyone does. Learning a new language is very challenging, so be patient with yourself. Keep in mind that most Italians are just as self-conscious and apologetic for their English as you are for your Italian. Are you longing to explore the sunny side of the Alps? In case you haven’t heard, South Tyrol is beyond a doubt Italy’s best-kept secret. This Alpine-Mediterranean jewel crowning the far north teems with more fascinating cultural diversity and contrasting natural beauty than anywhere else in Europe. If you’re one of the lucky few jetting off to this hidden gem, you’ve come to the right place. 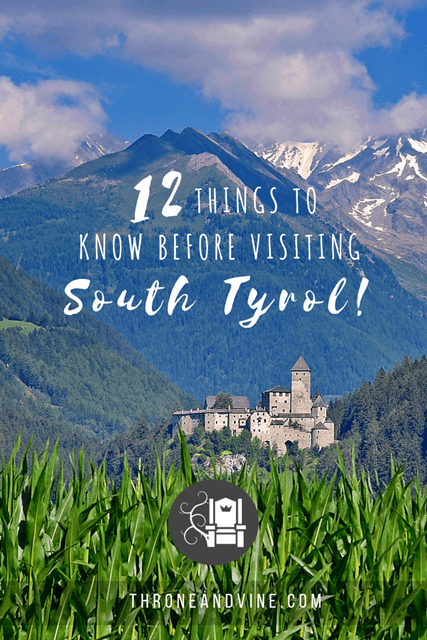 Below are 12 things to know before visiting South Tyrol (with plenty more travel tips tucked in). 1. Buongiorno or Guten Morgen? If you’re in the early stages of planning a visit to South Tyrol, you may be wondering why there is a German phrase in an article about a region in Italy. Nearly 70% of South Tyroleans speak German as their first language while 25% speak Italian and 5% speak Ladin. The result of this linguistic plate of spaghetti is that you’ll encounter road signs, menus and more featuring both German and Italian. All are the name of the same town. Signs posted in the Dolomites feature all three languages. Sound confusing? It’s not if you prepare a bit before arriving. While you really don’t need to know much German or Italian to enjoy your visit in South Tyrol, you’ll get more out of your trip if you familiarize yourself with keywords and phrases. Most locals are bilingual so they will appreciate you making the effort. We recommend picking the language that comes easiest to you and sticking to it throughout your trip. This will simplify everything from navigating roadways to ordering “vino” or “wein”. We’ve spoken with several travelers wishing to vacation in South Tyrol, but worry the lofty beauty of the Alps and Dolomites is beyond their reach given their older age or fitness level. Nothing could be further from the truth. South Tyrol ingeniously makes its breathtaking scenery available to everyone. Thanks to state-of-the-art lift systems set across the region, the young and old, skilled and unskilled, can partake in a multitude of activities among the peaks in every season. The degree of heart-pounding adventure is up to you. And with nearly 10,000 miles of trails, you will not run out of places to roam. Maximize your time on the mountains. Take advantage of the lifts whenever you can. South Tyrol’s mountain scenery is available to everyone thanks to lift systems across the entire region. Not all travelers like the idea of a cable car swiftly whisking them up several thousand feet. If that’s you, don’t despair. In many areas, you can hop in a funicular to carry you up and down the mountainside without ever leaving the Earth. For those worried about possibly becoming lost trekking in the vast mountainous landscapes. Don’t be. South Tyrol even takes care of that for you. Maps are readily available in tourist offices and near trailheads. Furthermore, trails are clearly marked with abundant signposts directing your next step. 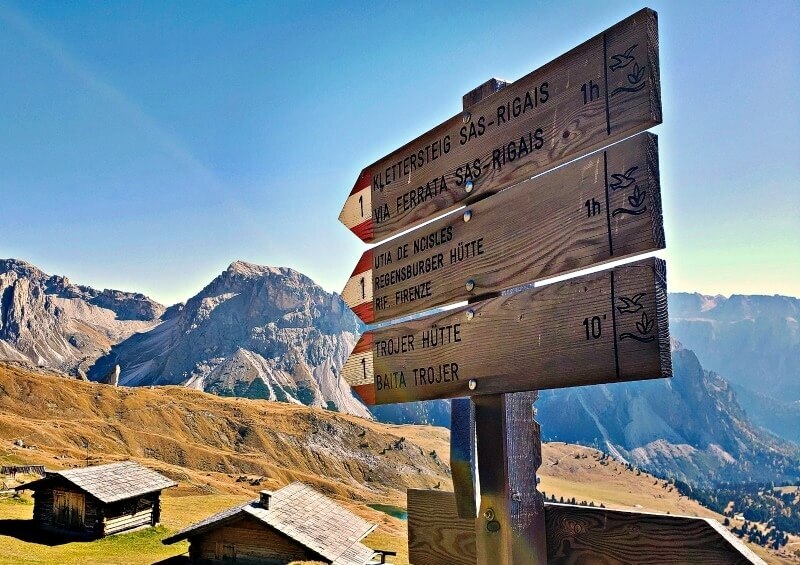 We have never had any kind of issue finding a destination, but before venturing into South Tyrol’s vast wilderness you should clearly understand how to properly read trail signage. Trail signs such as these are throughout South Tyrol making it virtually impossible to get lost. We have had cell phone reception in most places, but do not count on it in the remote mountainous areas. That said, we strongly recommend only pulling out your phone for the occasional photo. A holiday outing in South Tyrol is a time to reconnect with nature. Office emails can wait. 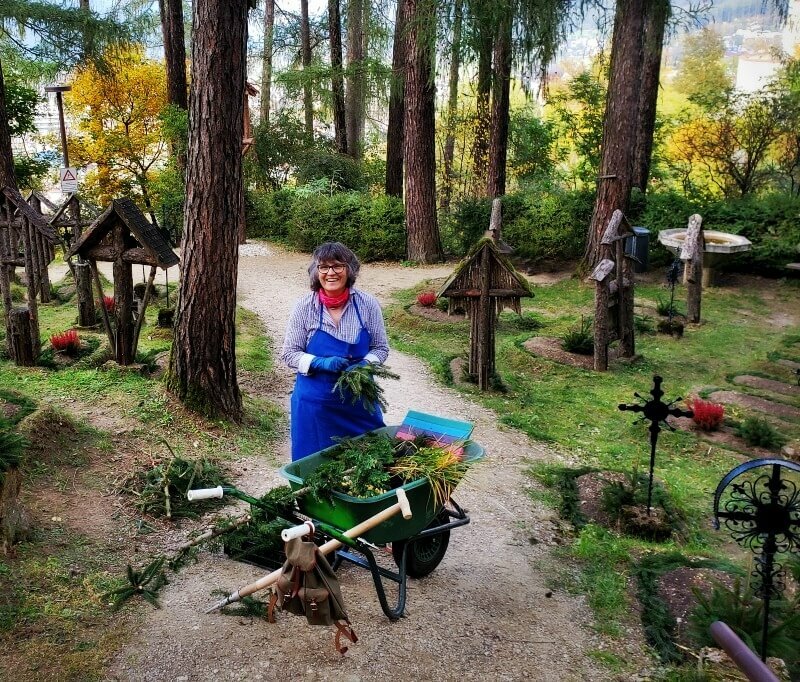 When visiting South Tyrol, you could easily spend all of your time in the heights of the Dolomites, but the natural splendor South Tyrol offers goes well beyond the famous jutting peaks. Wandering along South Tyrol’s Waalwegs is a must. We adore hiking these paths. They follow ancient water channels that gently ease up the Alps through countless orchards, vineyards, forests and meadows. 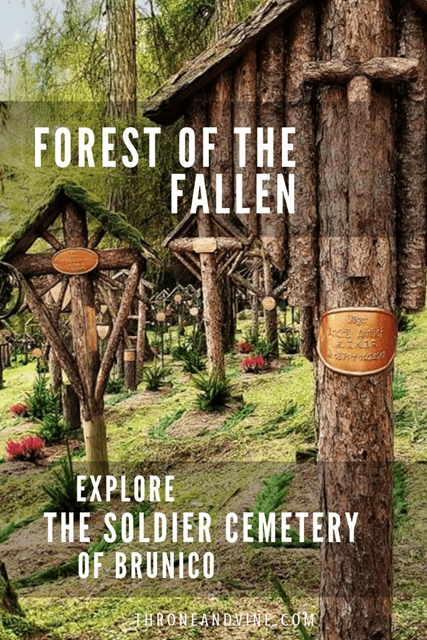 While meandering, you’ll enjoy the melody of snow-born water flowing at your feet and encounter crumbling castles, wayside shrines, quaint churches and farms and every other storybook scene you can imagine. Waalwegs offer the ideal way to immerse yourself in South Tyrol’s colliding Alpine and Mediterranean landscapes. You can find them throughout the mountains and valleys around Merano and the Venosta/Vinschgau region. Ancient water channels called “Waalwegs” lead you on hikes through unforgettable scenery. South Tyrol also possesses some of the most beautiful promenades in all of Italy. 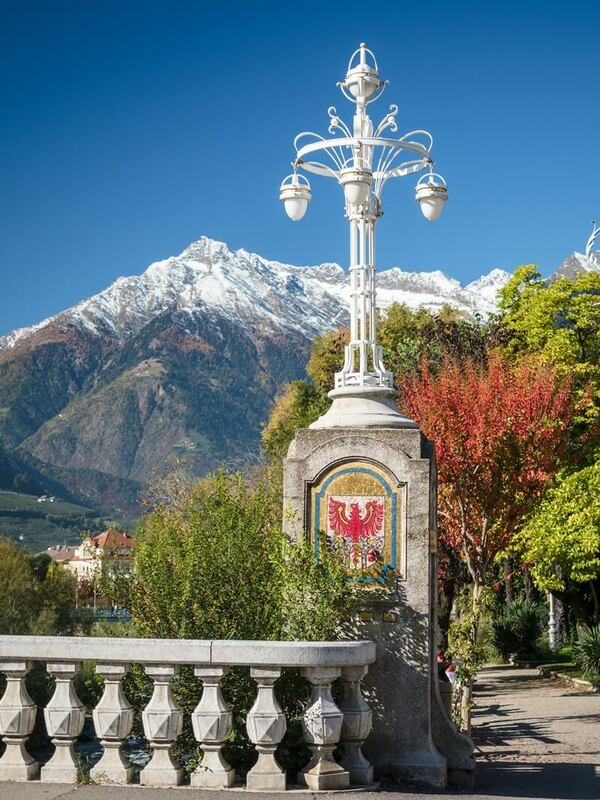 A few of our favorites are located in Merano and Bolzano. They expose walkers to an indelible blend of natural beauty and architectural marvels dating to the Middle Ages and beyond. 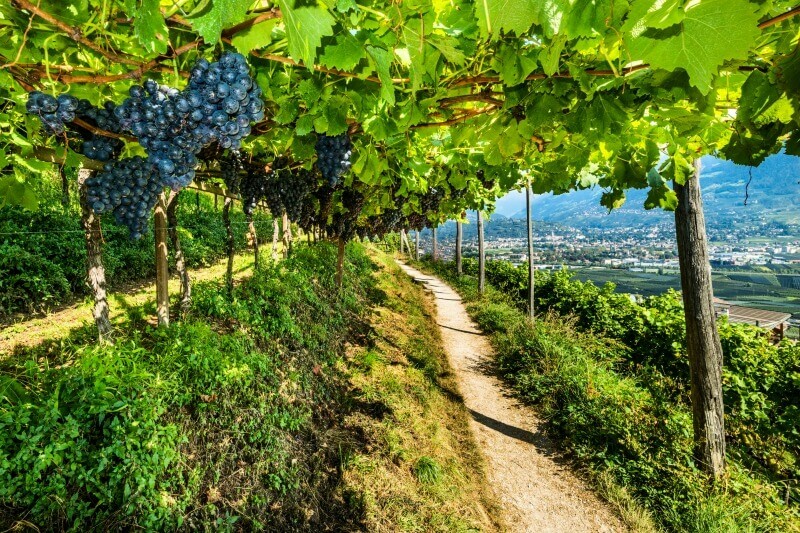 South Tyrol, known by many as the “land of wines”, could also be known for elevating winemaking into an art form. 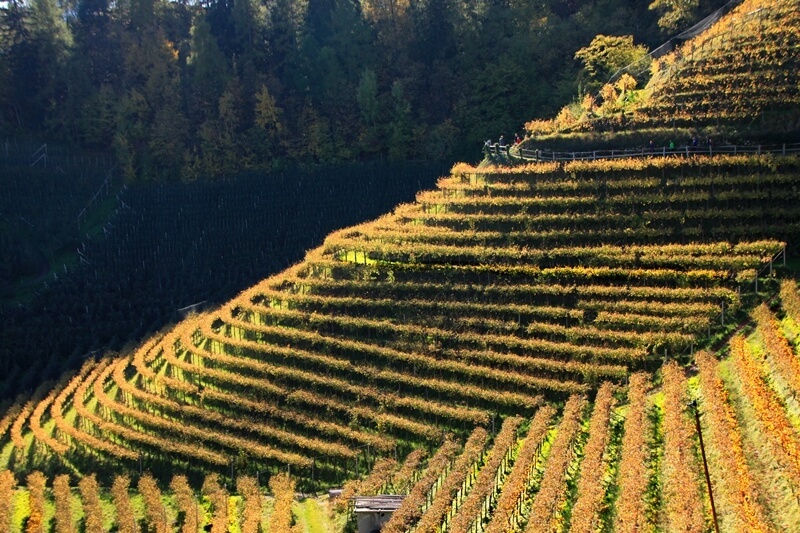 Over the last 3,000 years, South Tyrol’s wine artisans perfected practices to help vines flourish on the mountainsides. Arbored vineyards now tumble along sun-kissed slopes producing award-winning wine and scenery ripe for a Monet masterpiece. 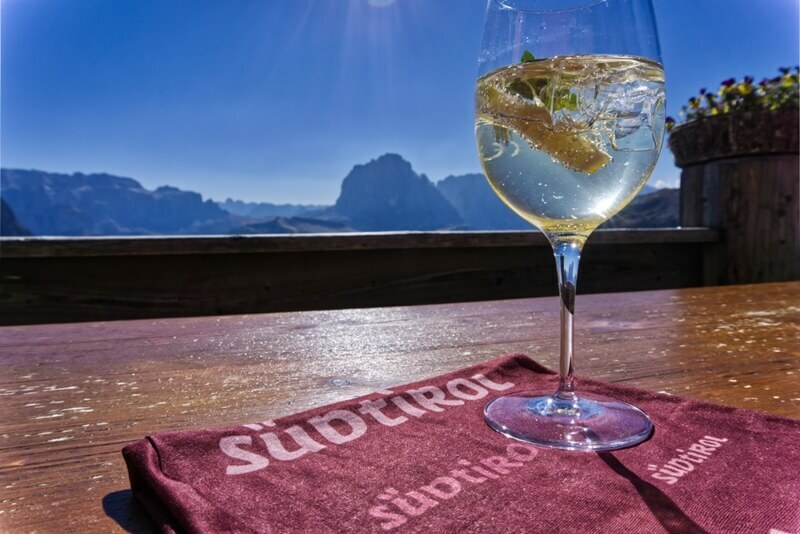 While you should no doubt indulge in the well-known classics of this region such as Pinot Grigio and Sauvignon Blanc, broaden your wine horizons by uncorking lesser known Alpine wines native to South Tyrol. This includes Lagrein, Vernatsch (also commonly referred to as Schiava) and Gewürztraminer. Wine with a view? World class wineries such as Cantina Tramin offering tastings along the South Tyrolean Wine Road. Gewürztraminer, originally from Tramin, a sleepy wine village in southern South Tyrol, is an aromatic and expressive white wine unlike any other. Be sure to try a glass or bottle of Gewürztraminer from the “Queen of Gewürztraminer”, Elena Walch. It is one you will remember. Another white you may not be familiar with, but you should definitely seek out while visiting South Tyrol is Pinot Bianco (also known as Weissburgunder). A close relative to Pinot Grigio, South Tyrol (Alto Adige if you prefer the official Italian designation for the region) produces the best Pinot Bianco in the world. You can read more about our encounter with this delightful wine during our visit at Nals Margreid Winery. 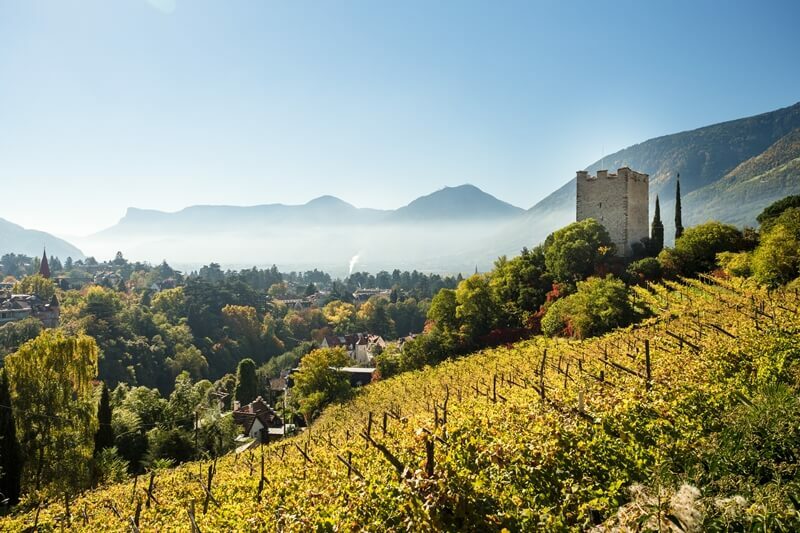 If you’re like us and are looking to do more than simply sip wine with your meals, make sure to schedule the time to venture along the South Tyrolean Wine Road. This picturesque road winds through several wine villages where you can embark on tastings at some of the finest wineries in the world. South Tyrol’s public transportation system is affordable and world class. Buses and trains can take you throughout much of South Tyrol. During South Tyrol’s busiest seasons public transit is the most convenient way to travel not mention budget and eco-friendly. However, if your heart is set on freely exploring South Tyrol, we recommend renting a car. 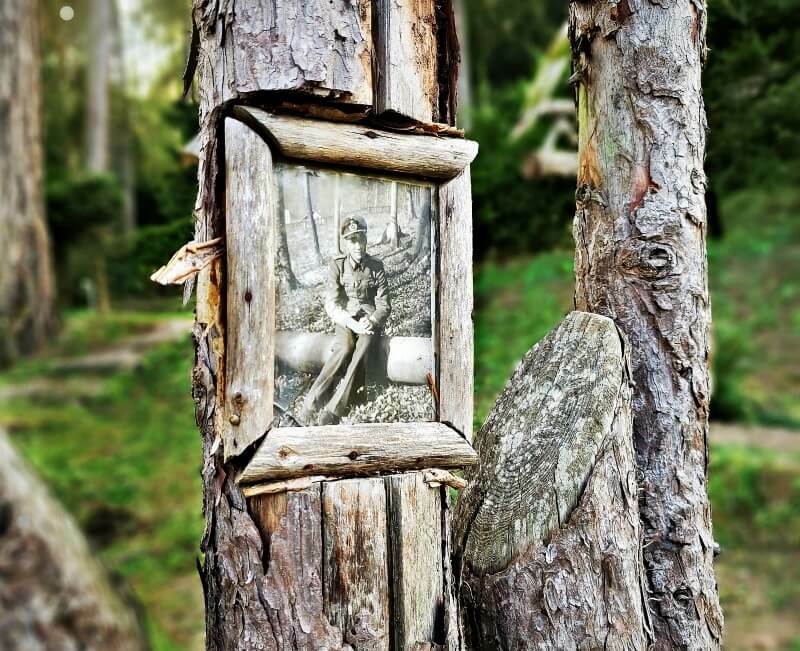 This allows you to discover the countryside at your own pace and explore off-the-beaten-path gems others miss. Navigating the roads in South Tyrol is fairly straightforward. And with today’s modern GPS units you can get step-by-step voice directions to take you anywhere without any hassle. Driving in the Alps and Dolomites for those not used to mountain roads may seem scary at first thought. But thanks to South Tyrol’s safety-focused roadway designs, one can become comfortable with mountain driving rather quickly. The mountain roads will naturally require greater concentration; however, several waysides exist along the roads allowing you to pull over to take a break or let others pass. Anyone with a bit of common sense and some pre-trip planning can easily handle Italian roads. To help out, we put together Driving in Italy Cheatsheets you can quickly reference while on Italy’s roadways. One of the more alluring aspects of South Tyrol is how it mends the mind, body and soul. The immense natural beauty, joyful celebration of cultural traditions and Alpine lifestyle invites you to slow down and soak in your immediate surroundings. South Tyrol is a pioneer in Alpine wellness. Discover more in our reviews of Preidlhof Spa & Resort and Hotel Quelle. Embrace this invitation. You will not regret it. We’ve always found South Tyrol’s slow travel and slow food appeal hard to resist even when we’re pining for the view over the next mountain top. South Tyrol is a haven for health and fitness enthusiasts. Beautiful spas and resorts, both rustic and contemporary in style, dot the landscape allowing you to reap the benefits of Alpine wellness. If staying at a spa and resort is not your speed or in your budget, you can still take advantage of South Tyrol’s curative powers at places such as Terme Merano. Additionally, South Tyrol offers an experience unlike anywhere else with its farm stays. 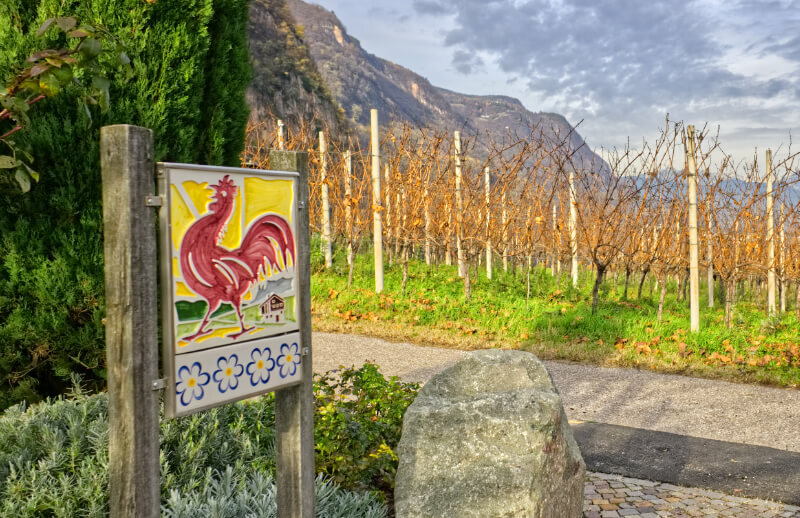 More than 1,600 farms, under the ‘Red Rooster’ seal of quality, allow you to connect with rural life in South Tyrol. You can stay in charming guest houses and partake in the joyful rigors of farming or simply sit back and admire the idyllic scenery from your balcony. Look for farmhouse inns under the Red Rooster brand shown here. 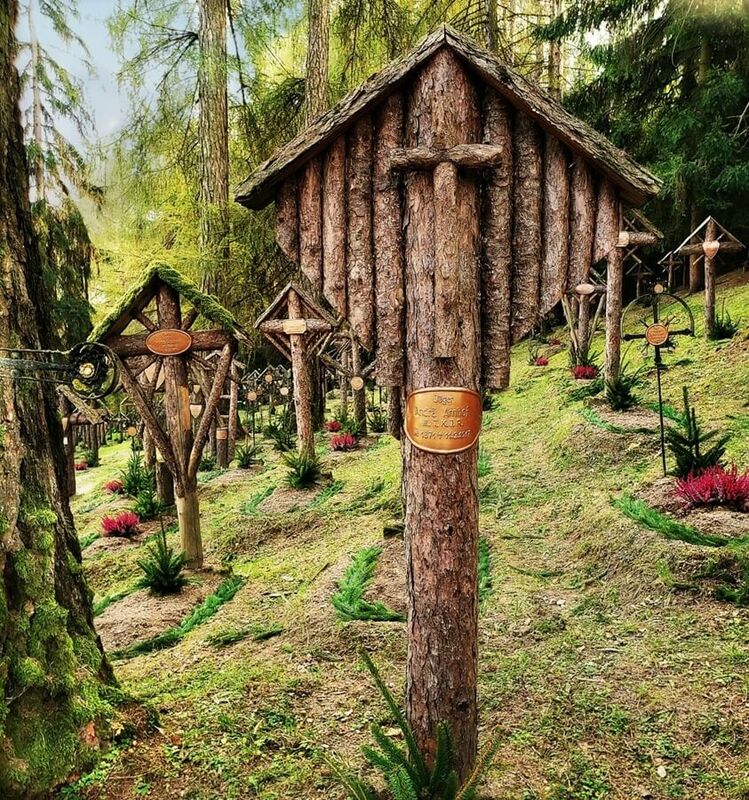 Few things do more to restore your wellbeing than waking up at an Alpine farm to the distant clang of cowbells and church bells echoing across a mountain valley. With more castles than any other part of Europe, South Tyrol undoubtedly draws from centuries of serving royalty to wow travelers at the table. In fact, the region is the culinary star of Italy — possessing more Michelin-starred restaurants than any other part of the country. 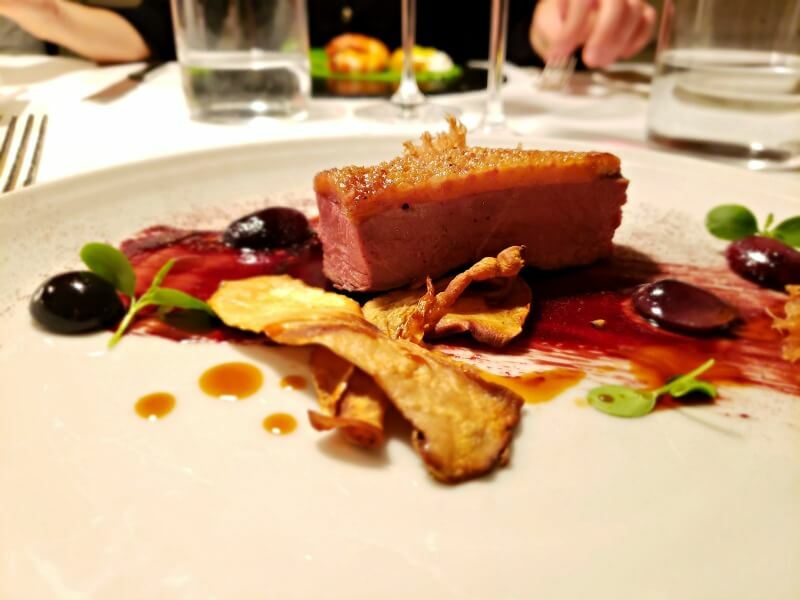 South Tyrol’s delicious blend of Tyrolean, German and Italian cultures, launches you on a delectable dining journey that is at once creative and traditional. Much of South Tyrol’s cuisine is strongly rooted in a farm-to-table custom thanks to the predominance of small scale farms throughout the region. It’s not uncommon for a South Tyrolean to personally know the farm behind her every meal. With each bite and sip you take in South Tyrol it’s clear they cherish high quality over high quantity. A vacation in South Tyrol is not complete without devouring hearty Alpine culinary delights like smoked speck and dumplings, called canederli or knödel. Combined they make a savory dish known as speckknödel, which is also served as a soup. Speck is one of South Tyrol’s most revered foods and is integral to countless Alpine recipes, not to mention one of our favorite companions to pizza. Not familiar with speck? It is a smoked, cured ham born from blending traditional Northern European smoking methods with the outdoor curing practices of the Mediterranean. We enjoy speck with breakfast, lunch, dinner and in between. Like desserts? You’ll fall in love with South Tyrol’s Buchteln. Of course, no one should visit South Tyrol without satisfying their sweet tooth. A tasty dessert you’ll come to crave is Buchteln — a traditional South Tyrolean marmalade-filled pastry served in vanilla cream. Since we are on the topic of sweets, another delight you must try from South Tyrol is the crisp wafers and snacks from Loacker. 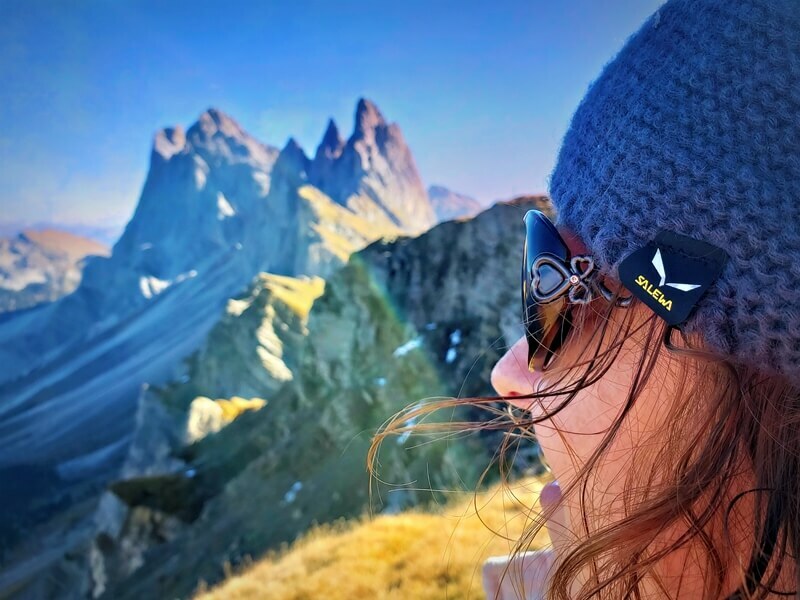 Founded in 1925 in Bolzano, Loacker’s mountain-size goodness isn’t a surprise considering the Dolomites sit in their backyard. Their products honor classic family traditions using only the best natural ingredients without any artificial colors or flavors. Adding some Loacker goodies to your backpack before hitting a trail is always a sweet move. 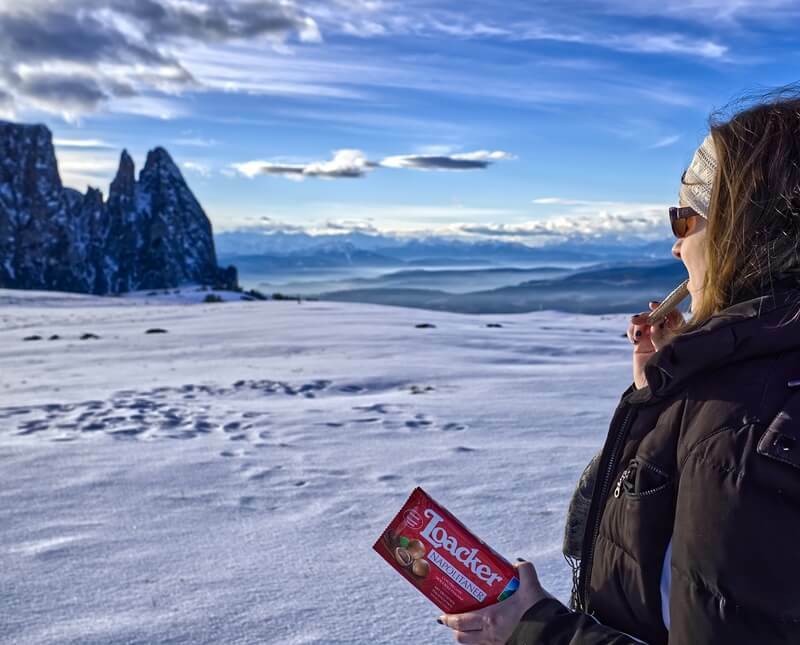 Keep an eye out for Loacker when picking up a snack or two for your hiking outings. Want to try them before visiting South Tyrol? You’re in luck. Go to the Loacker website to find out where they are sold near you. Numerous farmers’ markets take place throughout South Tyrol offering the ideal introduction to local specialties. Take the time to browse these markets. 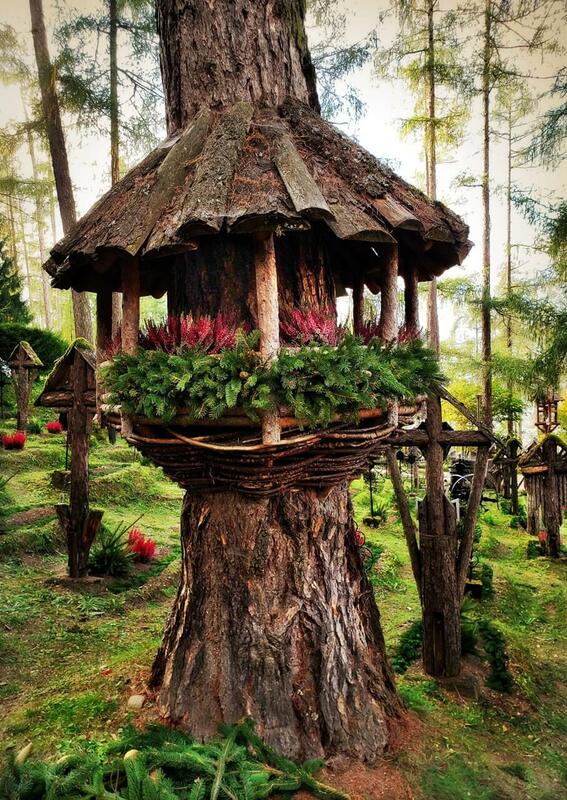 You’ll discover a variety of homemade breads and rolls, fragrant herbs, honeys, jams, as well as exceptional Alpine craftsmanship with unique items such as hand-woven baskets, wood carvings, traditional attire, religious artifacts and holiday decor. Beyond the streetside markets, plan to visit a Pur Südtirol store. 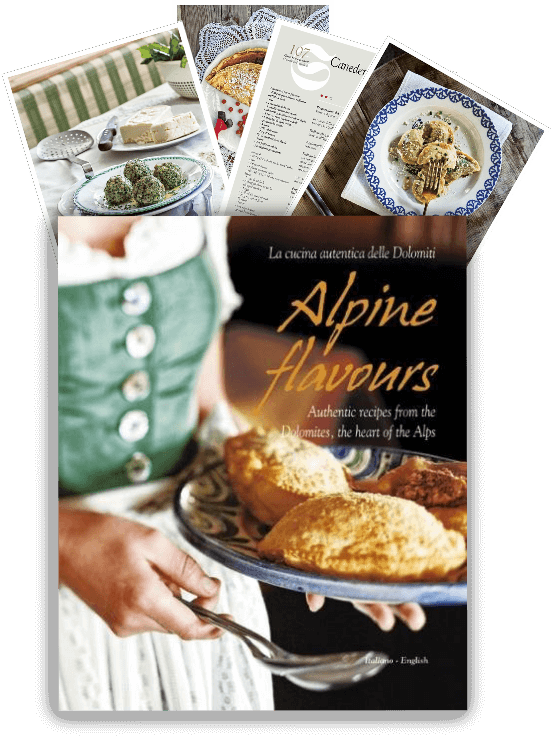 With locations in Bolzano, Merano, Brunico and Lana, these stores showcase a treasure trove of South Tyrolean goods. Inside you can browse more than 1,800 products from local farms. Any discussion about the wonders of South Tyrol without mentioning apples would be reckless. They are everywhere. The delicious fruit has been grown in South Tyrol for more than 1,300 years. Today, more apples come from South Tyrol than any other region in Europe. They are celebrated for their intense flavors and colors. 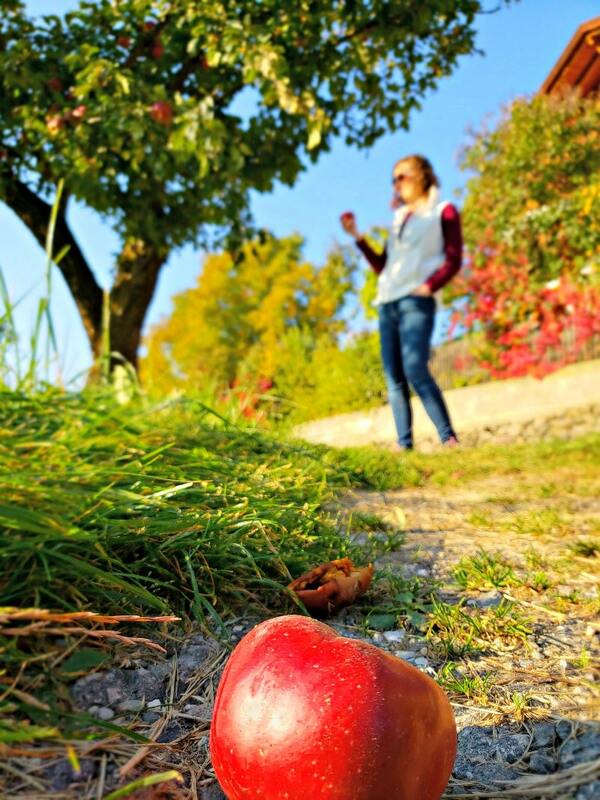 Rambling through South Tyrol’s apple orchards is an aromatic journey filled with scenery made to steal your breath. You’ll be tempted to steal a bite too, but keep your hands to yourself. You can visit any market to load up the deliciousness the apple trees drop to the valley floor. While you’re in South Tyrol make sure to pour yourself a glass of the region’s apple juice (called apfelsaft). The smooth sweetness it imparts on your lips will call to you long after you’ve left. It is a worthy alternative to wine any day. Apple strudel is a traditional treat that one must indulge in while visiting South Tyrol. Another apple-born gem you must try is traditional apple strudel (apfelstrudel). South Tyroleans typically enjoy this treat in the afternoon or after dinner as a dessert. However, we enjoy it whenever we can get our hands on it. While it will be tempting to complement all your meals with South Tyrolean wine, we’d be doing you a disservice if we didn’t tell you about South Tyrol’s milk. It is the Alpine nectar of the gods. Another must-try while visiting South Tyrol. If you’re not wowed after your first sip, modern life may have permanently dulled your taste buds. Fresh milk from the Alpine farms of South Tyrol is a must-addition to your morning cup of coffee. Of course when the milk is out of this world, it’s only natural that the cheese would follow suit. With over 200 varieties to savor, here’s a list of celebrated South Tyrol cheeses to get you started. Be sure to order a Hugo cocktail while relaxing on the slopes of South Tyrol. This world-famous drink was invented by a South Tyrolean in Naturns. It is a refreshing must-sip no matter when you visit. Don’t miss out on enjoying a Hugo while giving your legs a break. Those looking for a libation that packs a bit more punch than wine or a cocktail should definitely order a spirit called “Grappa”. Distilleries in South Tyrol produce grappa from the pomace of grapes (stems, skins, etc. left over after pressing). Many South Tyroleans enjoy grappa after meals to promote digestion. A dash of it is also commonly added to espressos. 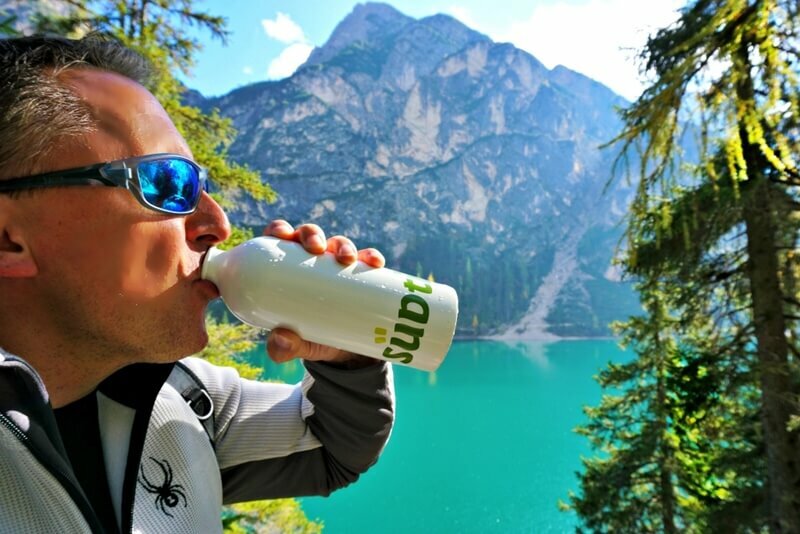 When it comes to quenching your thirst after a grueling outdoor excursion, the precious water from South Tyrol’s pristine mountain springs is a godsend. We consider it the best in the world. Before heading out on hikes, we fill up our water bottles with water from Plose or Meraner Minerlwasser. The purity of South Tyrol’s water elevates the sensation of refreshing to a new level. If you forget to add a bottle to your backpack, you can order the water at any of the mountain huts along the trails. 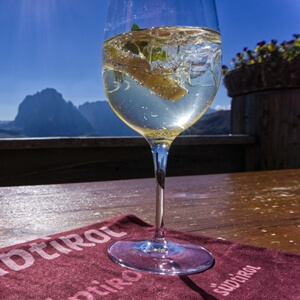 We consider South Tyrol’s bottled water to be the best in the world. South Tyrol bathes in 300 days of sunshine per year. All that heavenly light bestows on travelers an Alpine-Mediterranean oasis ripe for adventure and relaxation. But even with its sunny disposition, South Tyrol’s weather can be a bit unpredictable. This should be no surprise considering majestic Alpine peaks punctuate nearly every corner. Travelers simply need to be mindful of this when embarking on outdoor adventures. It’s best to pack rain gear or snow gear depending on when you’re visiting. Rain can occur anytime during the spring, summer and fall. Snow is less predictable. However, if you are visiting anytime from October through May there’s a chance you’ll be encountering old man winter. We were once caught in a spring rainstorm while hiking along a Waalweg. When we set out on the trail, it was a picture perfect day with just a few clouds lingering above us. Two hours later that all changed. The rain came out of nowhere. An ungodly amount of it. We were forced to sprint for 15 minutes to a hut set off the trail. 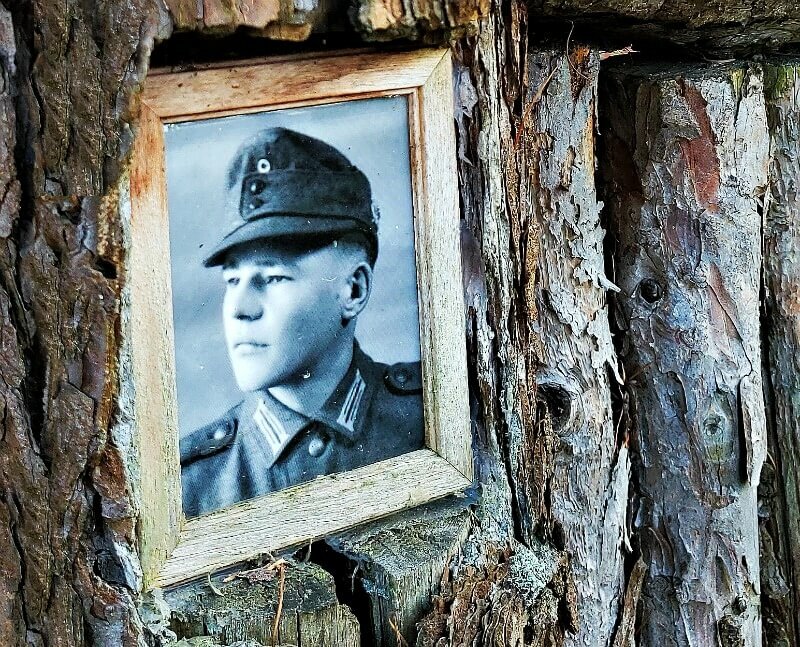 Fortunately, the host at the hut removed the chill from our bones with ample amounts of Schnapps. That, of course, led to another unanticipated adventure: hiking back to the trailhead on liquor-challenged legs. Much of South Tyrol’s beauty stems from opposing forces of nature. It’s important to wear the proper gear and be mindful of weather conditions as we noted above. That means hiking in sandals isn’t wise and venturing onto questionable cliffs or unmarked areas is just plain stupid. You don’t need to risk injury or your life to capture that next rock star Instagram photo. Like all mountainous areas, South Tyrol’s weather can rapidly change. Be smart. Be prepared. Our South Tyrol Resource Library includes a hiking checklist that helps ensure you stay safe while consuming South Tyrol’s great outdoors. At a minimum, we recommend tossing an umbrella in your backpack when visiting in the spring, summer and fall. We genuinely want you to have the adventure of a lifetime and that means using common sense and respecting nature. The currency in South Tyrol is the Euro. We recommend obtaining Euros from an ATM (called Bancomat) or bank when in Italy. ATMs are abundant. Even in South Tyrol’s most quaint villages. The majority of shops, restaurants and hotels accept ATM cards and credit cards. Don’t bother exchanging your cash at an exchange booth in an airport as you will not receive the best deal. If you’re ever not clear on the true cost of an item when looking at its price, download a money converting app onto your smartphone. There are plenty of free ones in your app store. 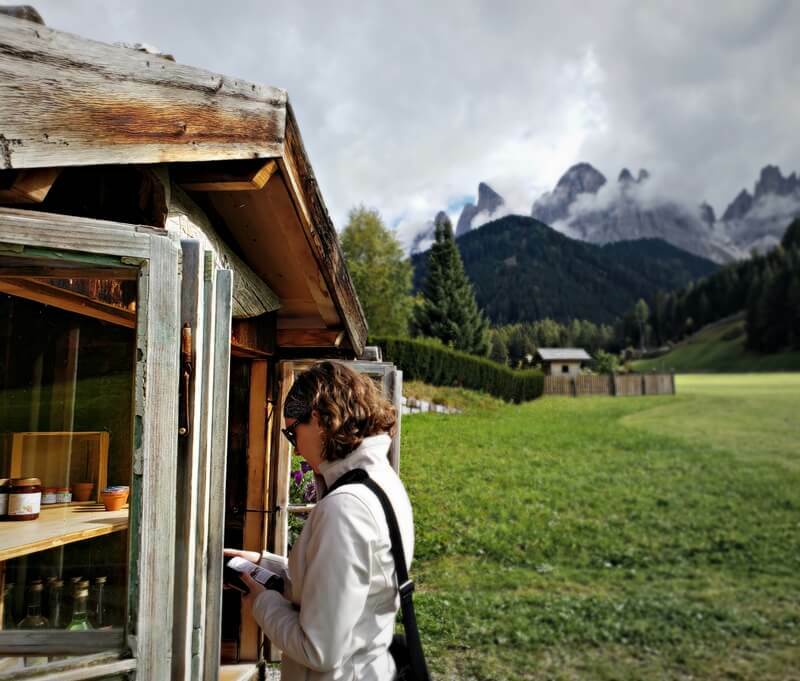 When roaming the trails in South Tyrol, you’ll pass many local farm stands displaying their outstanding specialties. We never miss an opportunity to support them. Be sure to bring some cash while hiking so you can do the same. These stands operate on the honor system. South Tyrol is incredibly credit card friendly. In most cases, you can get by at all times by using a credit card with a chip. However, we recommend carrying some cash as it’s much easier when making a purchase at a street or trailside food stand or at any of the many open-air markets you’ll no doubt want to explore. If you’re visiting during the holiday season, bring cash to South Tyrol’s Christmas markets. None of the stalls accept credit cards from our experience. When selecting a credit card for your trip be sure to understand if it charges international transaction fees. We recommend using a card that doesn’t charge any, but you may have a card that offers other perks which outweigh any fees incurred while visiting South Tyrol. Since we’re talking about money you may be wondering how expensive it is to visit South Tyrol. The region is surprisingly affordable. Prices are only slightly higher than Italy on average. You can find a wealth of accommodations fitting a wide range of budgets and tastes. If you want to save money easily, simply stay off-the-beaten-path in the less touristy areas. Tipping is not expected in South Tyrol; however, it is common to round up the bill if you had a pleasant experience. Since we’re talking about nature, let’s discuss seasons. South Tyrol has five of them. All are immeasurably enjoyable in their own way, but there is one that stands apart from the others: Törggelen. Törggelen is an age-old tradition that celebrates South Tyrol’s wine harvest. It begins in October and ends around the start of the Christmas season. During Törggelen, South Tyrol’s farmers introduce their new wines. These festive celebrations include pairings with roasted chestnuts and traditional South Tyrolean dishes. And best of all, live music inspires a jovial atmosphere that is as infectious as the wine being poured. Out of all the things to do in South Tyrol, Törggelen ranks near the top of must-have experiences. If you can time your South Tyrol vacation during Törggelen, you’ll get to experience a historic cultural treasure that rivals the scenery around you. 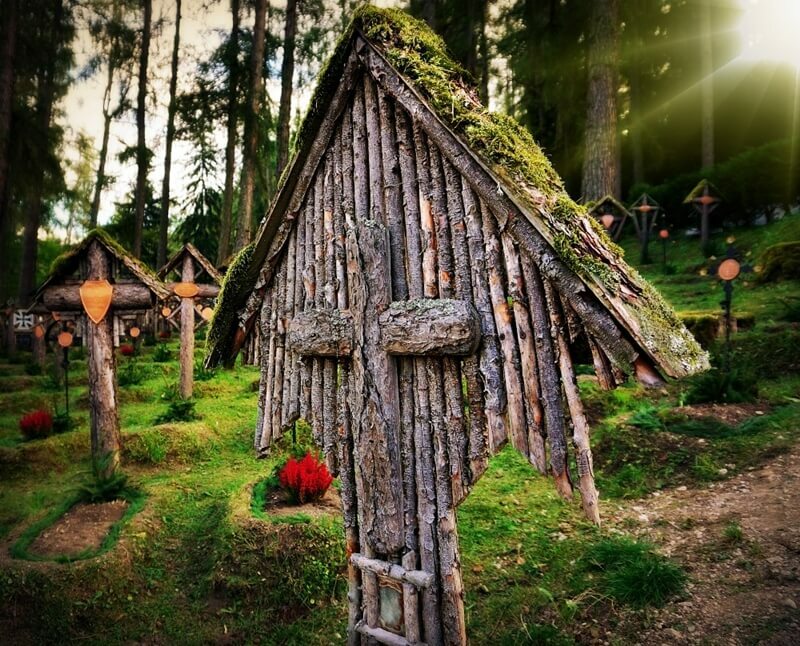 Hotels and inns book up fast during the Törggelen season so be sure to secure your accommodations well in advance. The final thing we’d like to share with you is a friendly word of caution. After visiting South Tyrol, you may just fall in love. Hard. South Tyrol is a place where the land, the people and their passions capture your heart. Forever. If you’re like us, you may toss out your travel wish list and put South Tyrol at the center of all your adventures. 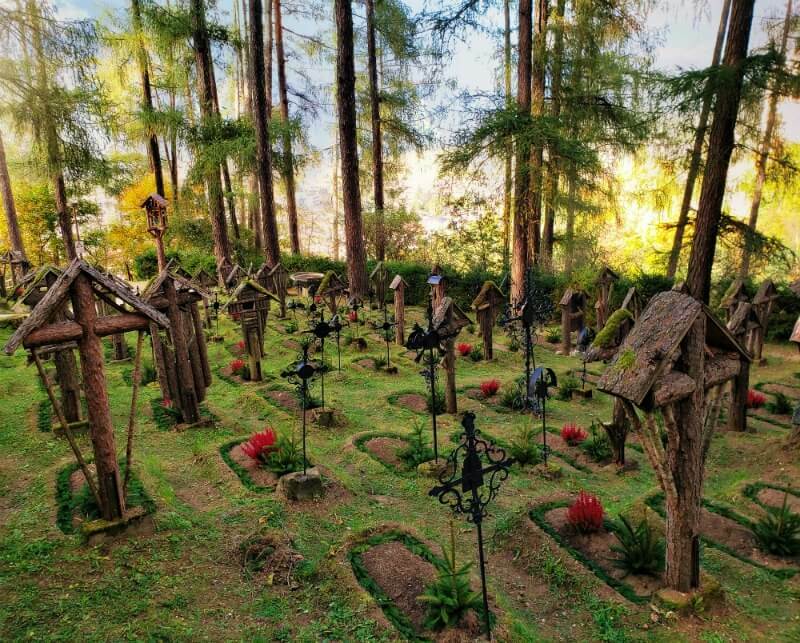 Don’t fret trying to see all of South Tyrol during your visit. You won’t be able to. Pick 2 to 3 main areas to explore and trust that you will be back. Creating a list of things to see and do while vacationing in South Tyrol could swallow up all the pages on the Internet, but we hope the insight above helps you embark on an unforgettable trip. Subscribe to our email updates and follow us on social media to discover more of the wonders of South Tyrol. If you have any questions on something we didn’t cover, please leave them in the comments below. Also, don’t forget to sign up for our free South Tyrol Travel Resource Library. Inside you’ll find useful tips and checklists to help save time and money while you plan your escape to South Tyrol. Finally, if you have crafted a South Tyrol itinerary, but are not positive it’s the best it could be, we can help. We know how overwhelming it is to make an itinerary with second- and third-hand sources. If you’re concerned about missing key destinations, experiences and hidden gems, our itinerary review service will better align your interests and smooth out logistics to maximize your time and money during your travels in South Tyrol. 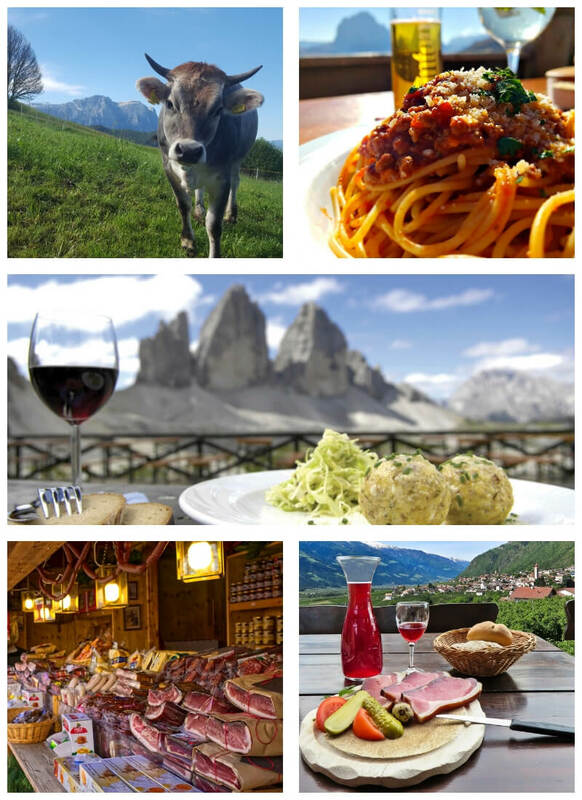 Click here to learn more about our South Tyrol Itinerary Review Service. TAP TO SAVE & FOLLOW US ON INSTAGRAM FOR MORE TIPS! With snow-kissed Dolomite peaks boldly calling in the distance and vineyards and castles punctuating every surrounding hillside, Bolzano wraps its arms around you and seductively whispers an indelible blend of German, Austrian and Italian influences deep into your being. 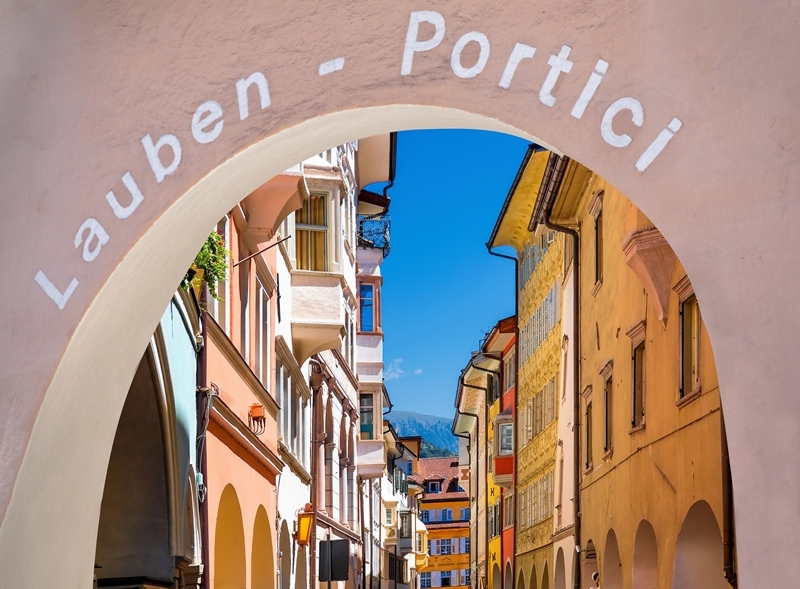 Tucked between Innsbruck to the north and Trento to the south, Bolzano—or Bozen if you prefer the roll of a German tongue—is a must-see for any traveler touring northern Italy. The capital of Italy’s South Tyrol region, the city is an Alpine-Mediterranean jewel amidst one of Europe’s top hidden gems. Often referred to as “The Gateway to the Dolomites”, the quality of life in Bolzano ranks at the top in Italy. No surprise considering it’s the perfect size, balancing all the perks of a vibrant, youthful city with old world charm and sensibilities. Its inviting cobblestone avenues dotted with cafes, pubs and shops welcome your every step. The city reveals centuries of influences and bears a history rivaling Rome with a man lost in ice for thousands of years and a gravely connection to the real-life Dracula. Head to the historic center of the city. Start your day with a hot chocolate, cappuccino or tea at one of Bolzano’s cozy street-side cafes. The Mediterranean climate in this part of South Tyrol makes enjoying morning’s light next to divine. Sit back and watch the city come to life. Go full South Tyrolean by ordering up a freshly-baked krapfen. Krapfen is a doughnut-like pastry filled with apricot or jam marmalade. Careful, as one may turn into two. While relaxing install the BZMobile app — the official guide to the city of Bolzano — on your smartphone. The app lets you flip through a comprehensive list of attractions, restaurants, walks and more. Now take a deep breath. It’s okay. You’re not going to see everything Bolzano offers in one day — this is a dolce vita town made for stopping and smelling the roses. Now is a good time to plan to stay in the area longer. If that’s doable, consider obtaining the Bolzano Bozen Card. This card is complimentary at participating hotels and provides free access to numerous museums in Bolzano and 90 other museums throughout South Tyrol. Included with the card are English-speaking city tours and guided excursions to the Dolomites National Park, along with free use of all public transportation throughout South Tyrol. The best way to discover a city is through its culinary traditions. You can embark on such a mouth-pleasing adventure through the Bolzano Street Food Tour. This 2 ½ hour outing begins at 10:00 a.m. and includes 5 stops where you’ll indulge in local specialties such as bread, sausage, sweets, as well as historical nuggets shared by your tour guide. If you enjoyed one too many krapfens, a morning food tour may not be for you. In that case, set off on your own to see some of Bolzano’s treasured sights. The perfect starting point is the city’s “living room” or Waltherplatz, which is the town square. At the center looms a remarkable statue of Walther von der Vogelweide, a renowned poet and Minnesinger from the Middle Ages believed to have been born in South Tyrol. Sculpted in 1889 from South Tyrol’s revered Lasser marble, the statue stands on an impressive fountain encircled by flowers. Walther Square in Bolzano and the remarkable monument of Walther von der Vogelweide. The Waltherplatz is the ideal spot for lingering and people watching. From late November to early January, it hosts one of Italy’s largest Christmas markets. The square comes alive like a wintry fairy tale with puppet shows, decadent pastries, mulled wine, horse-drawn carriage rides and 80+ stalls of seasonal gifts, treats and crafts. If you’re visiting at this time, we highly recommend taking public transportation instead of driving due to the popularity of this market. The perfect harmonization of centuries-old charm with a stylish eye toward tomorrow makes Bolzano a cultural treasure that calls to you long after you've left. From the square, it’s impossible to miss the Gothic-Romanesque cathedral of Our Lady of the Assumption, which is the largest Gothic church in South Tyrol. The cathedral was originally constructed in the 12th century and took on its Gothic form in the 14th century. It has an ornately patterned roof to match the vibrancy of the square and a steepled bell tower chiseled skyward. The stonework is striking. Two weathered lions guard its entrance and form the base of two columns supporting an archway. A massively forged door with curious carvings of the Isarco river and the Dolomites welcomes worshipers. Inside, lovers of medieval art can enjoy frescoes from the 1300s and marvel at the cathedral’s stunningly sculpted pulpit, which was completed in 1507. Leaving the cathedral, head to the Via Portici (also called Laubengasse) just north of the square. This was the very first street in Bolzano. A pulsating center of trade for nearly 1,000 years, arcaded shops now greet you on both sides. While the shops are fun to explore, the real treat is admiring the colorful facades. They exhibit a melodic blend of Italian and German architectural influences. Along Via Portici, you’ll also find the Mercantile Museum and Mercantile Palace founded by Claudia de‘ Medici. This is the only Renaissance-style building in Bolzano. It once served as a court of justice for the Mercantile Court. Today, the museum tells the fascinating story of Bolzano’s economic importance through the centuries. After consuming so much history, art and architecture it’s only natural to settle in for a long lunch. 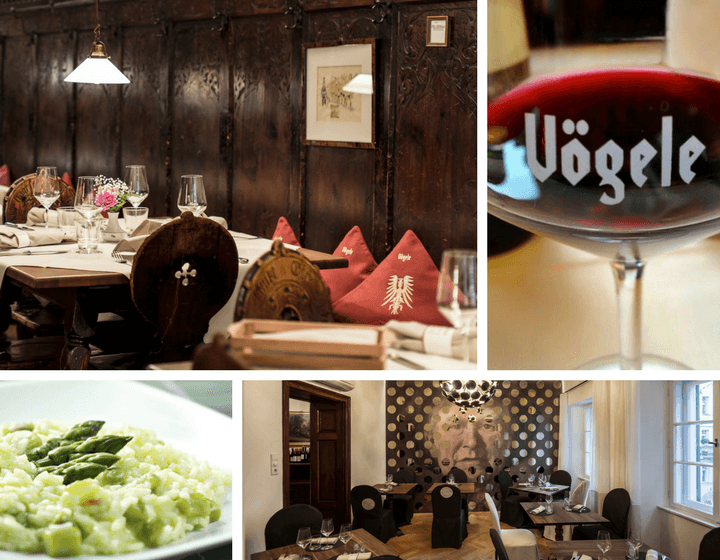 Experience a true South Tyrolean meal with a glass of the region’s celebrated wine at Wirtshaus Vögele. 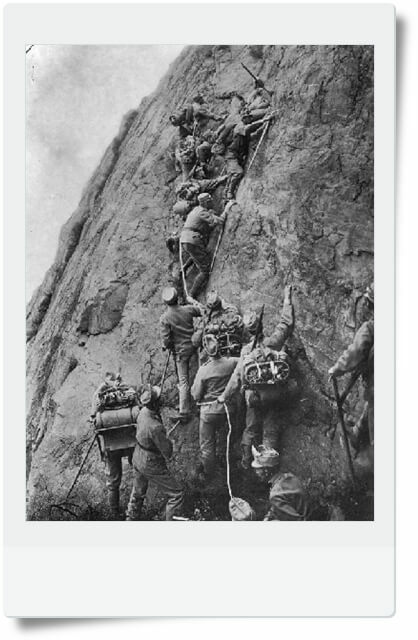 A cultural gem of Bolzano, the establishment was first mentioned in 1277 and held secret gatherings in World War II. Gaining entrance to these meetings required whispering “Vögele”, which means “little bird”. 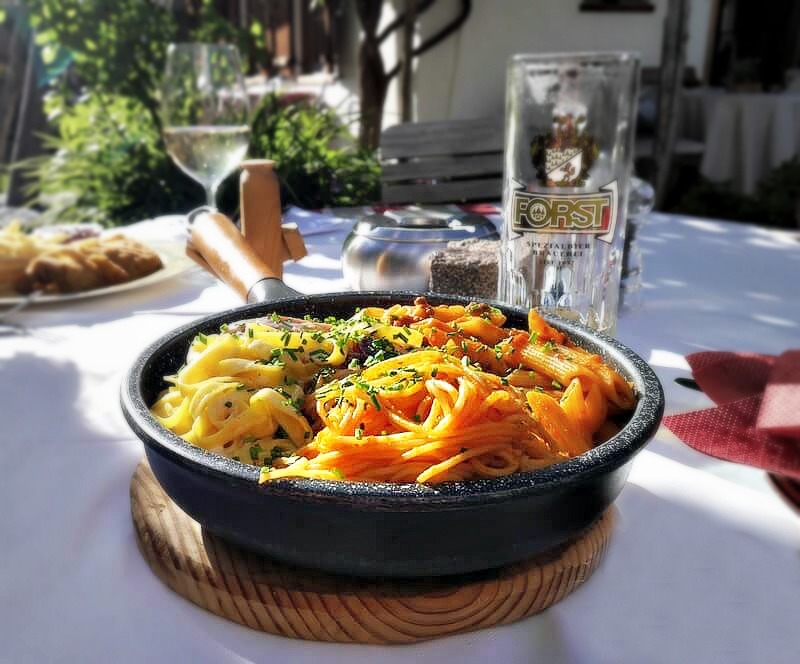 Wirsthaus Vögele is a member of Sudtiroler Gasthaus — an organization dedicated to carefully preserving South Tyrolean restaurant culture and quality. The restaurant conjures a cozy atmosphere with a winding assortment of dining rooms each offering its own ambiance. If you visit during asparagus season in April or May, be sure to try a dish with “spargel”. Our asparagus risotto was as good as a sweetly sung melody from Walther von der Vogelweide himself! Experience a true South Tyrolean meal with a glass of the region’s celebrated wine at Wirtshaus Vögele. After lunch, head west on Via Portici. You’re about to go back in time…way back. 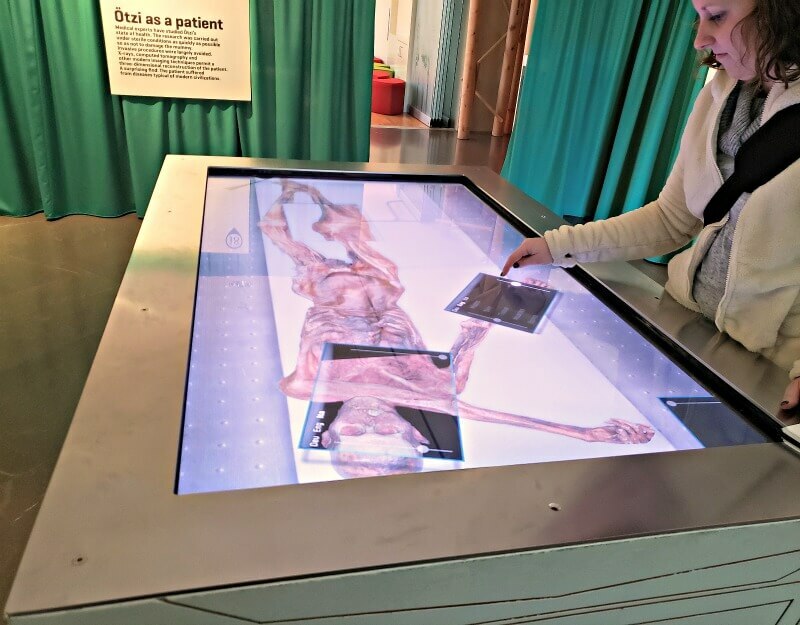 You’ll eventually come to the home of Bolzano’s most famous resident at the South Tyrol Museum of Archaeology. 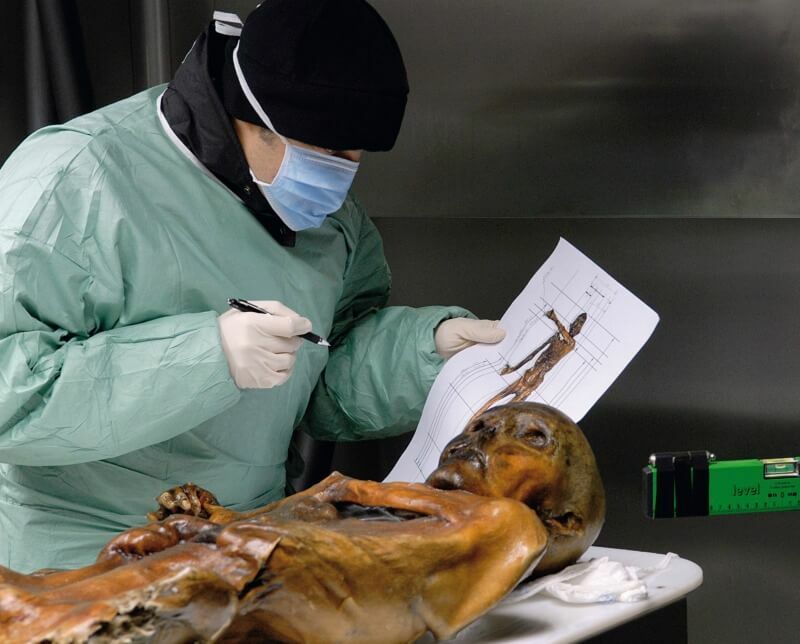 At the age of 5,300 years old, Ötzi the Iceman is a remarkably well-preserved corpse. 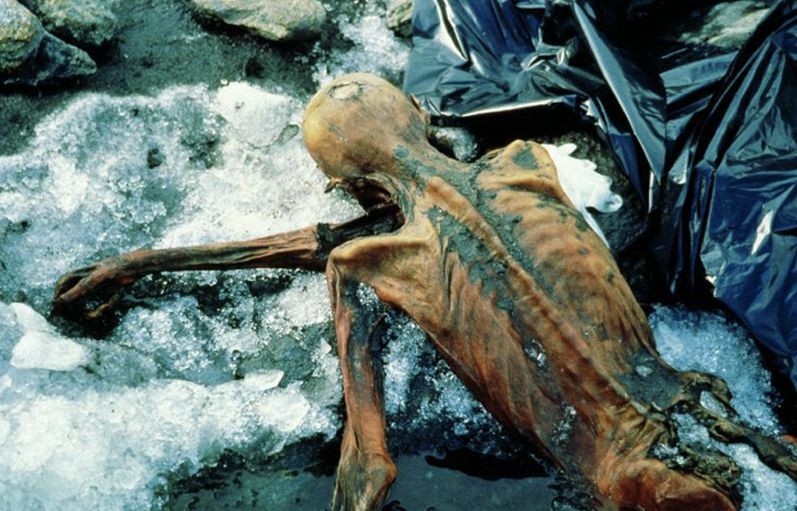 Mummified naturally by glacier ice, he’s the oldest intact human body ever found. 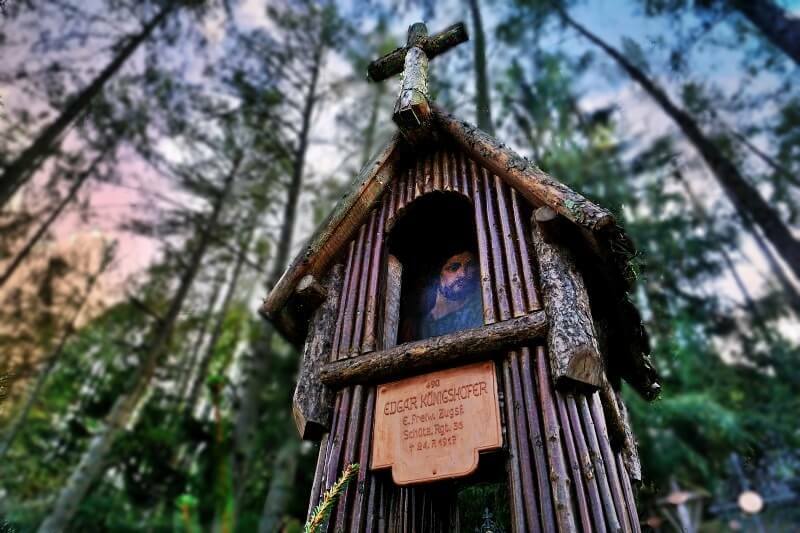 He was discovered by two hikers in 1991 on a mountainside in South Tyrol’s Ötztal Alps. 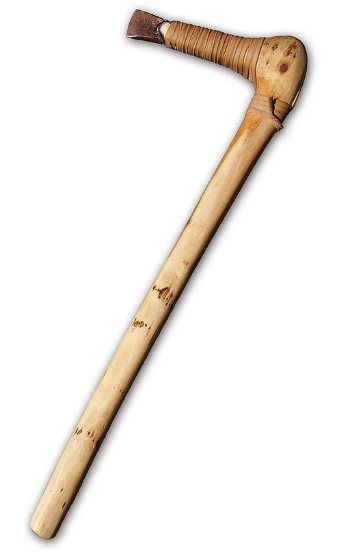 Analysis of his body indicates an arrow cut ole Ötzi’s life short. Fortunately, that type of hospitality has long left South Tyrol. 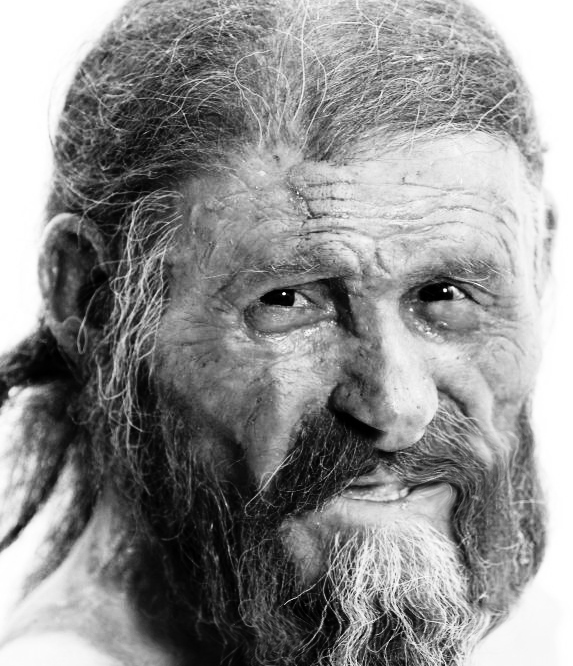 If Ötzi were alive today no doubt he would be the leader of a biker gang. Scientists discovered 61 tattoos across his body. We highly recommend buying your tickets online before you go. 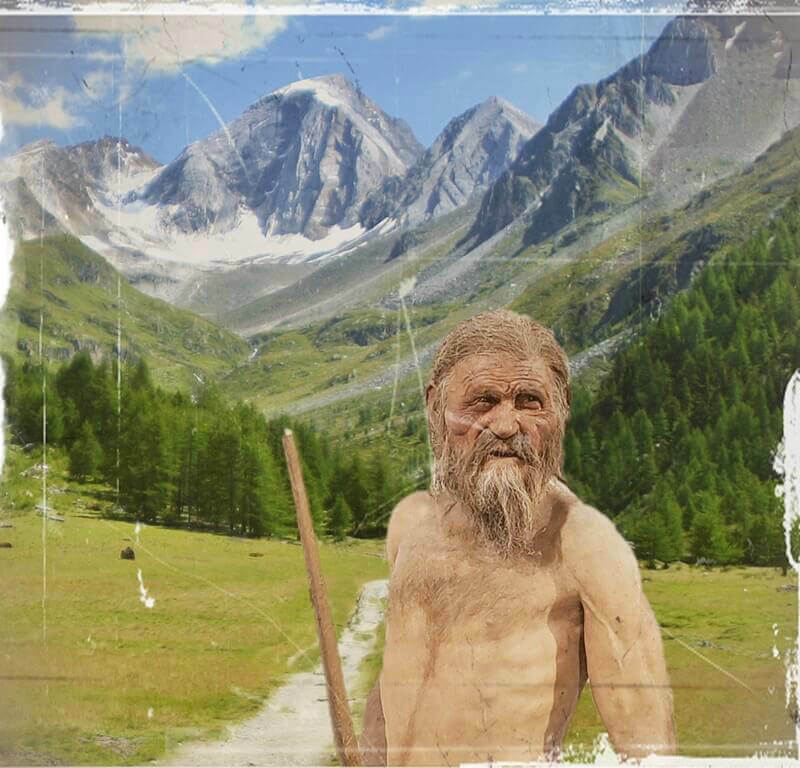 See our latest post for more riveting facts about the life, death and discovery of Ötzi. Encounter the face of an ancient. 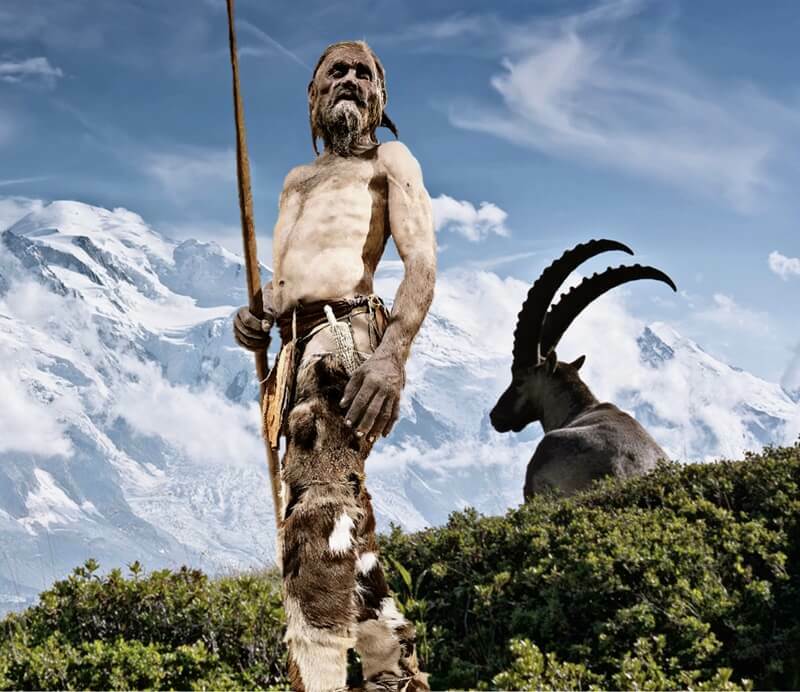 The South Tyrol Museum of Archaeology shelters 5,300 year-old Ötzi. Head back to the city center to the Piazza delle Erbe, a lively marketplace since 1295. Spend some time browsing the stalls overflowing with fresh fruits, vegetables and other specialties. If you walk away without picking up some delicious snacks you’ll be insulting a 700+ year tradition! From the market, wander north along the Franziskanergasse to the Franciscan Friary. Founded in 1221, the friary contains a Gothic church, chapel and cloisters with frescoes dating back to the 14th century. It is believed Saint Francis attended mass in the Chapel while accompanying his cloth merchant father on a business trip to Bolzano. Another legend also enshrouds the friary albeit one much more nightmarish. The funeral stone and tomb of the real-life Dracula’s grandson forever marks its hallowed walls. Tread lightly. The funeral stone of Dracula’s grandson never takes its eyes off you. 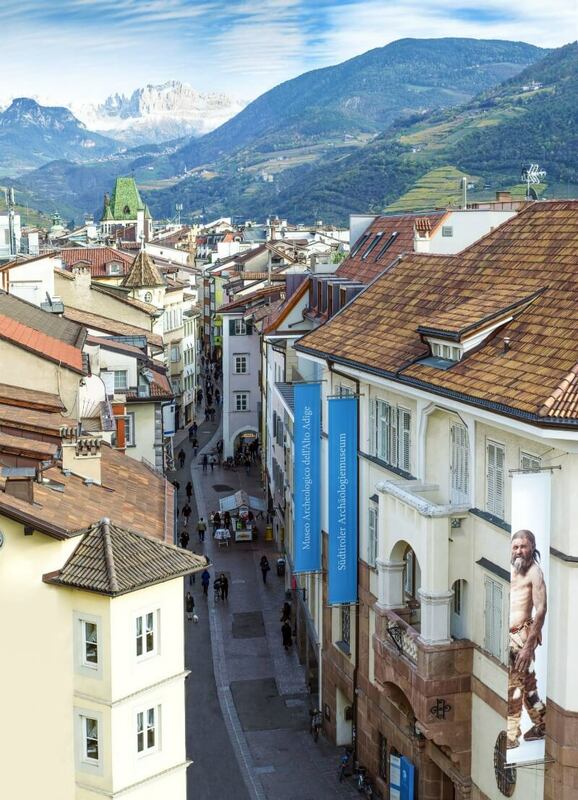 If your day has not been consumed by the old town charms of Bolzano, you can either hop back in your car or rent a bike for a 25-minute ride to the Messner Mountain Museum Firmian located within Sigmundskron Castle. 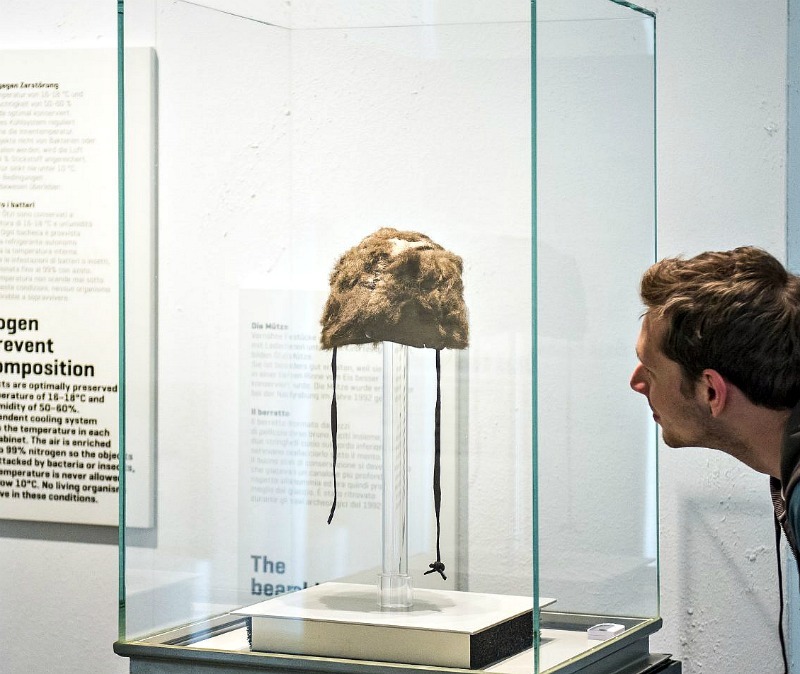 Just 4 miles southeast of Bolzano’s city center, this museum explores the relationship between man and mountain as inspired by the legendary climber Reinhold Messner (check out this piece about why Messner is the world’s great living man). 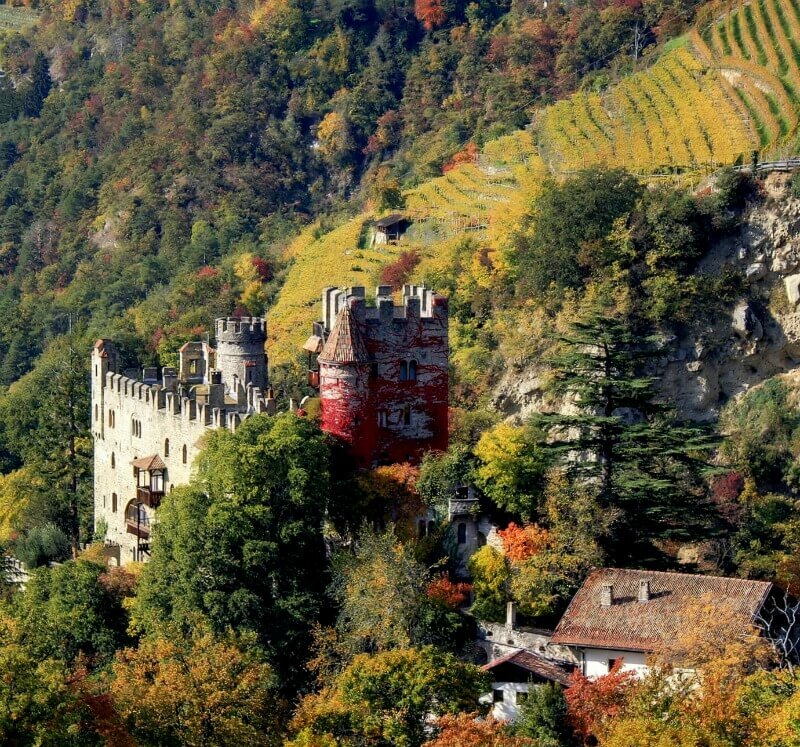 Next, you can venture up to the ancient ruins of Schloss Rafenstein, which watch over the city of Bolzano. 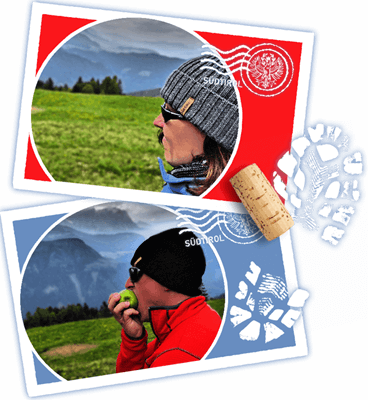 Enjoy some of the South Tyrolean treats you picked up earlier as you admire the views. 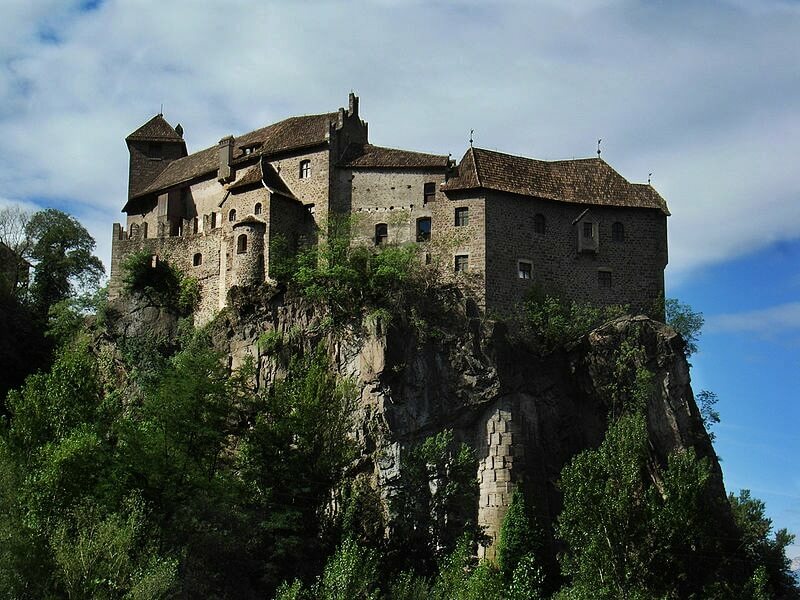 Then head over to Castel Roncolo (Schloss Runkelstein), also known as the Painted Castle (note: the castle is also accessible from the Talvera-Promenade in the city center or the line 12 shuttle bus from Waltherplatz). This well-preserved 12th-century castle showcases frescoes inside and out lending a colorful window back to life in medieval times. Castel Roncolo is a well-preserved 12th-century fortress that lends a colorful window back to life in medieval times. After touring its museum, you can grab dinner at the restaurant within the castle. But our recommendation is to head back to the city center to dine at the much celebrated Parkhotel Laurin Restaurant. Here, you can let the culinary magic of head chef Manuel Astuto dazzle your senses. Some of the world’s biggest movie stars have come to crave his South Tyrolean creations — flying him to prepare meals at their private parties. No matter where you choose to eat, be sure to order a glass of Lagrein as you’re in the home of this robustly flavored, but smooth wine. Chef Manuel Astuto is a culinary star at the Parkhotel Laurin restaurant. 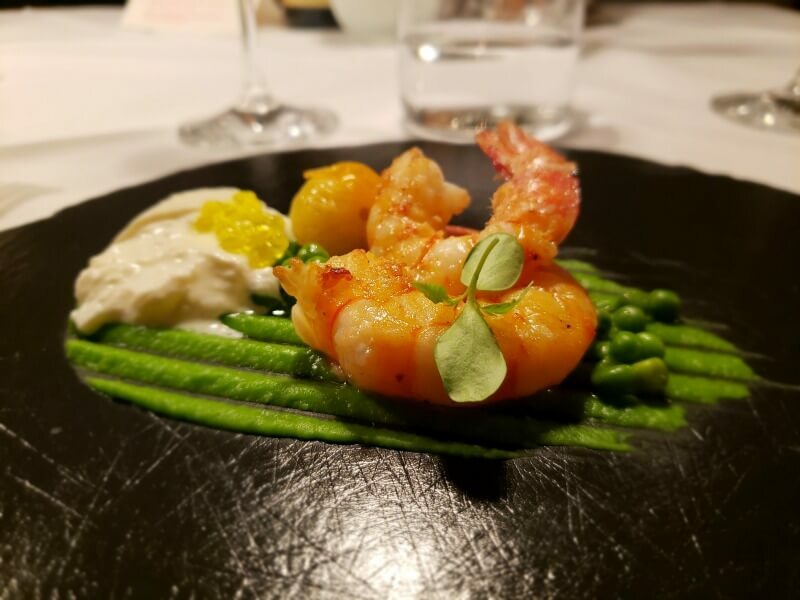 A master in creating dishes with mouth-watering presentation and equally arresting flavors. If castles are not your thing, another option in the afternoon is to catch the Ritten/Renon cable car. It whisks you high above Bolzano to the Ritten / Renon high plateau. From up here, you can hike a variety of trails and soak in wide open views of the Dolomites’ Rosengarten and Schlern massifs. You can also trek to the surreal 25,000-year-old Earth pyramids. These odd natural formations look like stone thorns piercing the mountainside. An almost eerie sight you will not forget. The San Genesio cable car offers a climb to even more hiking paths. This is home to the Haflinger horse which is a blonde horse breed born in the mountains of South Tyrol. Visit nearby stables and book a horseback ride or let someone else take the reins and enjoy the views from a horse-drawn carriage. 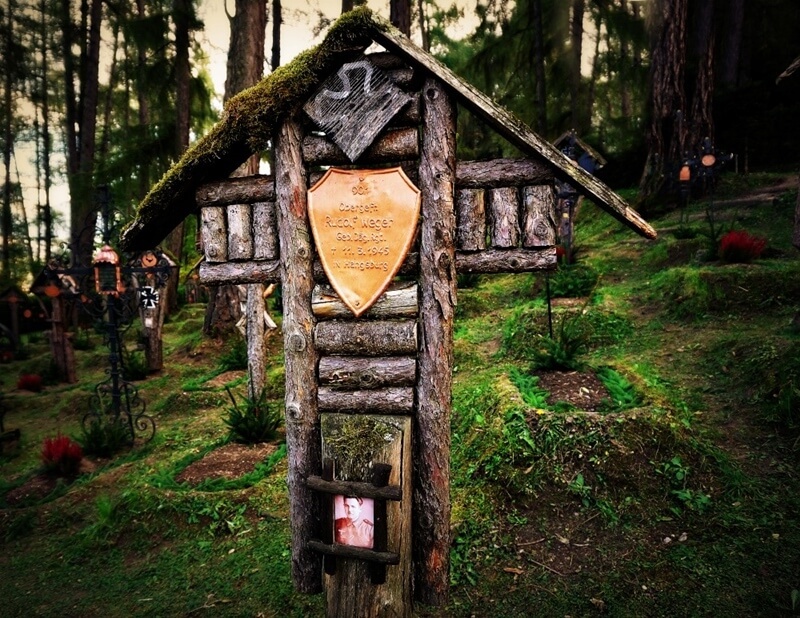 Numerous alpine huts dot the trails allowing you to stop for a meal and a drink. 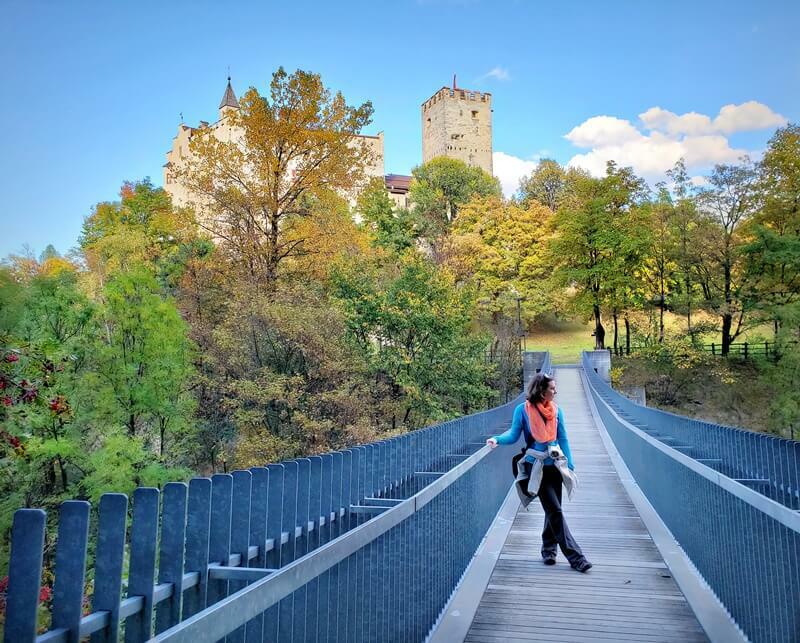 The multi-hued autumn colors are the perfect time for relaxing walks along the Renon Chestnut Trail, with views of the Rosengarten mountain. If you’re visiting other northern Italy destinations such as Venice or Lake Como, Bolzano is an easy trip add-on. It’s just 2 to 3 hours away by car, bus or train. Arriving by car is utterly gorgeous. Check out our guide on driving in Italy to ensure you’re ready. We recommend parking on the outskirts of the city center. 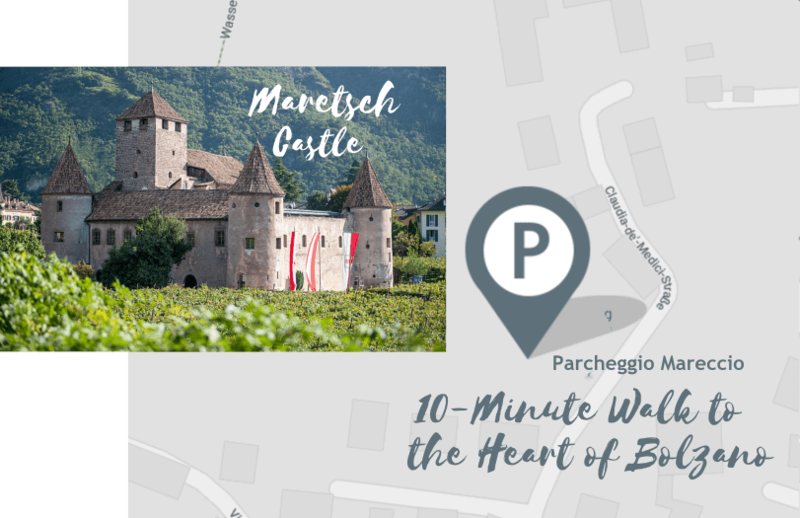 The Parcheggio Mareccio is a convenient lot located off Via Claudia de’ Medici with the 13th-century Maretsch Castle as its backdrop. The castle is now an event center, but tourists can visit when events are not taking place. Its tower boasts one of the best views of Bolzano. From this lot, you can easily be in the center of Bolzano within a 10-minute walk. On your way back to your car, opt for a scenic stroll along the “Meadows of Talvera”, a beautiful park set along the river Talvera. Our first exposure to Bolzano left us craving more and we’re certain yours will too. The perfect harmonization of centuries-old charm with a stylish eye toward tomorrow makes the city a cultural treasure that calls to you long after you’ve left. If you’re like us, you may just want to make Bolzano, Italy your new home! We’d like to give special thanks to IDM Südtirol for arranging our lovely tour with our guide Luciano Rech. We highly recommend him. Learn more about tour options here. Have you been to Bolzano? Let us know what you enjoyed the most in the comments below. 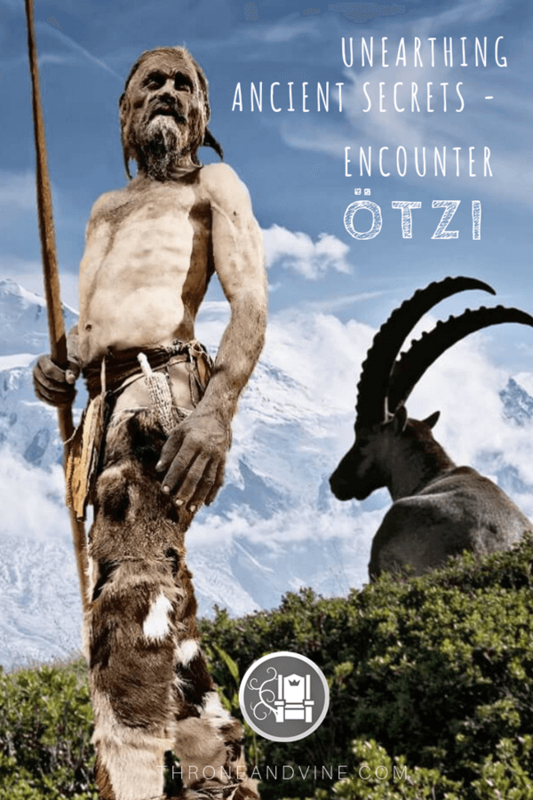 The Ötzi photos provided courtesy of South Tyrol Museum of Archaeology.